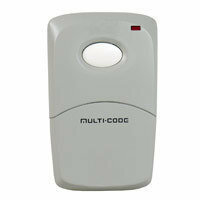 The Stanley Multi-Code MCS308913 one button visor remote is designed for garage door and gate operator applications. Visor clip and 9v battery is included. Programming Instructions Included with your order. The Stanley Multi-Code remote uses a 10-position on/off coding switches to set the remotes code. You use the 10 dip switches for setting the code to match a remote or receiver. The Stanley Multi-Code remote will only activate receivers set with the same code using the 310MHz frequency. This Stanley Multi-Code remote MCS308913 is not a universal remote and only works 310MHz systems.